The star of JUSTICE LEAGUE DARK and HELLBLAZER—the longest-running Vertigo series—is unleashed in his own DCU title! Liar, cheater, manipulator…John Constantine is all of these, and yet he uses these skills and more to protect the world from the darkest corners of the DC Universe. Collects Constantine #1-6. The star of JUSTICE LEAGUE DARK and HELLBLAZER—the longest-running Vertigo series—is unleashed in his own DCU title! Liar, cheater, manipulator…John Constantine is all of these, and yet he uses these skills and more to protect the world from the darkest corners of the DC Universe. Collects Constantine #1-6. I’ve not been as familiar with Constantine, apart from laughing at his antics and situations in the DC series Bombshells. I adore what happens there with Zatana. I have yet to watch the series, but it is on my ‘to watch’ list. I do remember a lot about the Keanu Reeves film, but I don’t know how close that is to the character, himself. 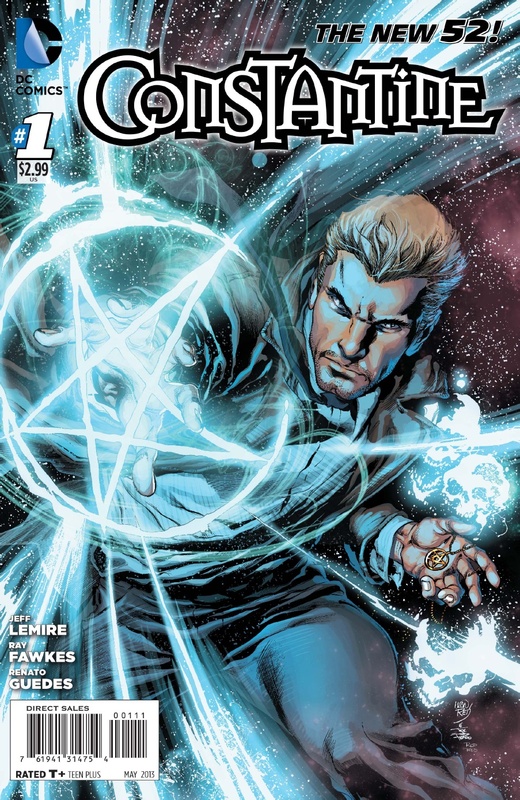 The New 52’s Constantine Vol 1 is a collection of the first few issues of the new series. It’s a great place for old fans and new fans to jump in. There’s some exposition for new people, to set the scene for what to expect from the series as it is relaunched, but in a way it does nothing to set up Constantine as a hero. While he may do heroic things, he is presented with some pretty awful choices. As a result, what he has to do to get ahead is even worse. While I’m not sure I want to continue exploring the Constantine character, I am really happy I got the opportunity to read this via my library’s Hoopla database.